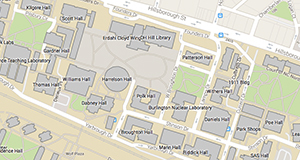 The Center for Geospatial Analytics joined an elite group of worldwide university departments in 2017 when it was named an Esri Development Center. 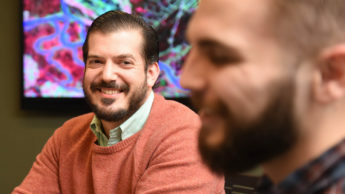 Congratulations to the 2019 EDC Student of the Year: doctoral candidate Jason Matney. 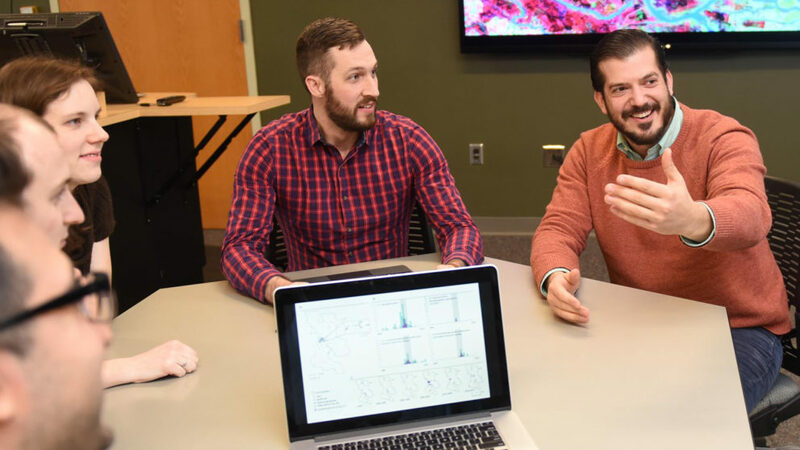 Through a new partnership called Geo-IDEAS, NC State’s Center for Geospatial Analytics and Wake County government are innovating the future of spatial analysis and decision-making. 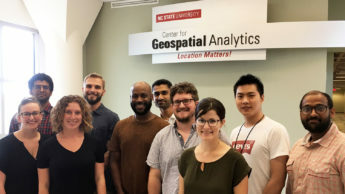 For the past eight semesters, Geospatial Analytics Ph.D. candidate Jason Matney has taught hundreds of students as a graduate teaching assistant and course instructor at NC State. As he prepares to defend his dissertation, he reflects on his experience and the future of his field. 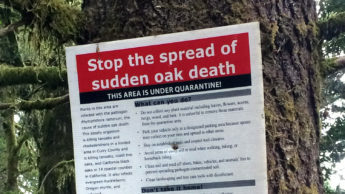 At the 2018 AGU Fall Meeting, Geospatial Analytics Ph.D. student Nick Kruskamp presented his latest research using satellite imagery to track changes in forest health. 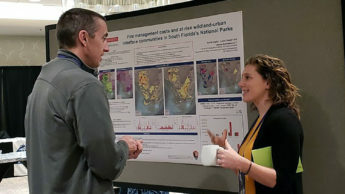 At the Human Dimensions of Wildfire Conference, Geospatial Analytics Ph.D. student Nicole Inglis discovered how bridging boundaries will be a key component of her fire management research. 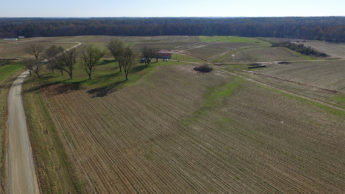 At the 2018 AGU Fall Meeting, Geospatial Analytics Ph.D. student Kellyn Montgomery presented her latest research examining predictors of crop yield with drone imagery of agricultural fields. Geospatial Analytics Ph.D. student Kellyn Montgomery is the 2019 NC State recipient of the Herb Stout Student Award and will represent the university at the NC GIS Conference in February. 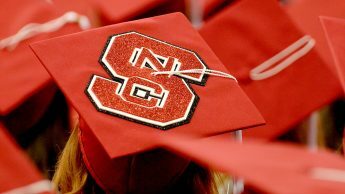 Congratulations to Our December Graduates! 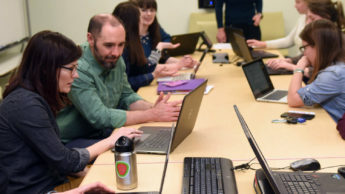 At December graduation, 40 members of the Center for Geospatial Analytics community will be recognized for completing their graduate programs. 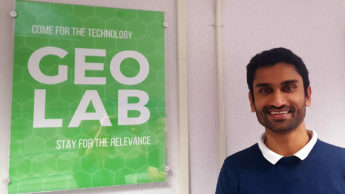 Curious about what our Geospatial Analytics Ph.D. students work on for their dissertations? 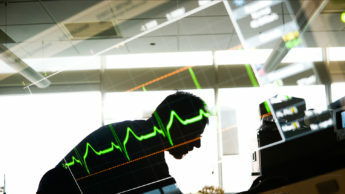 Check out how they and their advisors use geospatial analytics to impact a range of fields. It’s graduate school application season! Find out where the Center for Geospatial Analytics stands when it comes to providing an exemplary doctoral education.